UPPER: Two adult animals, Zanzibar, Tanzania. (Up to 70mm long alive). July, 1971. Note added 4 Feb 2006: Philinopsis cyanea is almost certainly a synonym of the earlier Philinopsis speciosa Pease, 1860. See that Fact Sheet for a fuller discussion. 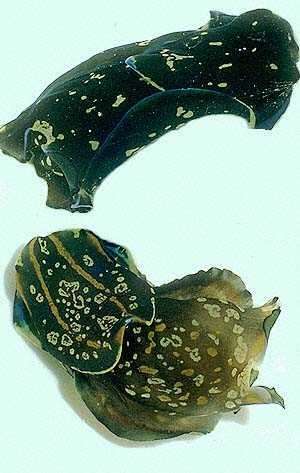 Philinopsis cyanea, is quite a variable species found throughout the tropical Indo-West Pacific. It varies in colour from plain black to black with blue, white, yellow or brownish-yellow markings. Sometimes animals have a pale brown background colour. Juvenile animals are often more colourful than adults. In my picture alongside, of a juvenile animal from Dar es Salaam, Tanzania (May, 1974), you can see the characteristic shape of species of Philinopsis. The posterior edge of the headshield has a tapering crest, which stands erect, and the body is cylindrical in shape. Species of Philinopsis are usually found burrowing through sand or mud. They have lost their radular teeth. There are two quite distinct groups in the genus, one with a large eversible buccal bulb like Philinopsis cyanea, and a second with a long tubular pharynx like Philinopsis gardineri. The group with the large buccal bulb feed on other bubble shells, such as Bulla, Atys and Haminoea. They feed by partially everting their large muscular buccal bulb, (or pharynx), to envelop their prey which they swallow whole. After digestion, the empty, unbroken shell of the prey is regurgitated, being too large to pass through the gut. Species of Philinopsis, when collected, often spit out two or three clean, unbroken bubble shells. I remember once in Zanzibar collecting some animals from sea grass beds where the bubble shell Bulla ampulla was also abundant. The Philinopsis ranged in length from 30-70mm and within 2 to 3 hours all had regurgitated 3 to 5 Bulla shells ranging in length from 5-15mm. They clearly have quite an impact on the ecology of their neighbourhood. • Rudman,W.B., 1972. A comparative study of the genus Philinopsis Pease, 1860 (Aglajidae, Opisthobranchia). Pacific Science, 26: 381-399. • Rudman,W.B., 1972. Structure and functioning of the gut in the Bullomorpha (Opisthobranchia). Journal of Natural History, 6: 547-560. What is Philinopsis cyanea doing? 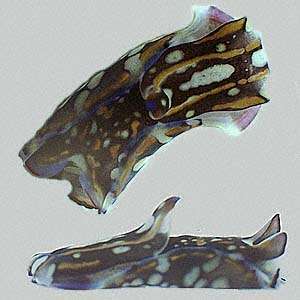 Philinopsis cyanea from Lord Howe Is.